Detailed review of Dr. Stephen Langer's Ultimate 16 Strain Probiotic with FOS. See how this probiotic supplement compares against all the others! Overall, I gave Dr. Stephen Langer’s Ultimate 16 Strain Probiotic with FOS 1.5/5 stars. I really wanted to rate this product higher but it fell short in major areas. To start, let’s go over some of the positives to this probiotic. First off, it’s extremely affordable! This is actually one of the cheapest probiotics I’ve tried so far as far as price goes. So I really like that! It even has an amazing 1-year, 100% money back guarantee (and pays for your return shipping). It’s also easy to use, just take 1 veggie capsule per day with water or juice. The capsules are nice and easy to swallow and are a lot smaller than average. This formula uses a prebiotic FOS and trace minerals, which both aid in the enzymatic processes that help promote healthy bacteria levels and proper digestion. Now let’s talk about what I don’t like about this product. First and foremost, it just didn’t work for me. I have Irritable Bowel Syndrome and probiotics are the main way to treat the annoying and painful side effects that come along with this stomach disorder. I unfortunately didn’t feel any better while taking this supplement. It didn’t help with my gas, bloating, or constipation. Also, another main reason I don’t like this probiotic is because it doesn’t use enough CFU to be effective. It only has 3 billion CFU. However, it uses 16 probiotic strains, which may cause adverse side effects in people. I also use probiotics for feminine health and I actually got a yeast infection while taking these probiotics! Obviously so there are so many causes of a yeast infection but I was highly disappointed that this happened while taking this particular supplement. After going to the doctor, I got a prescription but she also stated to take a daily probiotic supplement to help treat and prevent further infections. So I continued with this probiotic and still found zero benefits. Overall, I was really let down with this probiotic. In each capsule of Dr. Stephen Langer’s Ultimate 16 Strain Probiotic with FOS, there are 3 billion CFU in 16 probiotic strains. I like that the company utilizes Bifidobacterium longum in this supplement. This strain is suggested to have anti-inflammatory properties and may help ease seasonal allergies. Research studies suggest that it may help with diarrhea related to antibiotics, upset stomachs, weight management, infections, healthy cholesterol levels, and bone health. Another strain I like is Lactobacillus reuteri. This particular probiotic strain is thought to have unique abilities to help protect and promote a healthy colon and immune system. It may also help fight candida, lower cholesterol, and improve overall gut health. One strain I actually don’t like is Lactobacillus casei. The reason why I’m not a big fan of this strain is because it has a tendency to be a little aggressive and may even overrun the good bacteria that’s in the body. This probiotic may contain trace amounts of milk from the fermentation process. Other than that, it doesn’t list any allergy concerns on the bottle or on their website. I really prefer when companies state explicitly what is or isn’t in the formula as far as potential allergens go. It does say that the capsules are vegetarian, which is a perk. The other ingredients include: Microcrystalline cellulose (plant fiber), vegetable capsule (hypromellose, gellan gum), alfalfa, may contain one or both of the following: magnesium stearate, silica. For $15.99, you get a bottle of 60 capsules, which will give you a 2-month supply. The directions say to take 1 capsule daily. So it ends up being $0.26 per day to take. That’s incredibly affordable and cheap. 26 cents is much less than your average probiotic. Although the price is fantastic, the quality isn’t. I was disappointed with this probiotic and don’t think it ends up being a good value for the price. Sadly, you sort of get what you pay for. I didn’t notice any side effects from this probiotic. I wasn’t sure how I was going to feel because it uses a TON of strains (16). Often times you can experience side effects when companies use a great deal of different probiotic strains. Unfortunately, while I didn’t notice any negative side effects, I didn’t experience any positive side effects either. This was a bummer because I didn’t feel like the supplements were working or benefitting me at all. Swanson offers an absolutely amazing guarantee! If you aren’t completely satisfied with any product(s) purchased within the last 12 months, you just simply return the unused portion and receive a full refund, plus return postage for United States orders. You can’t really ask for a better guarantee. A yearlong satisfaction guarantee plus they pay return shipping, kudos to them! I think more companies should offer these types of guarantees for their customers. 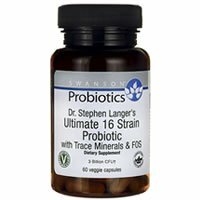 To buy Dr. Stephen Langer’s Ultimate 16 Strain Probiotic with FOS, click here.